i asked my mom what this dish is really called. “chickpea fry”. yes, but what is the name of the dish? i hear that it’s a very common sri lankan snack, served at cricket games and dinner parties alike. so surely it must be referred to as more than the ingredient + cooking method. “we call it kadala back home”. which translates directly to chickpeas. mmkay. “chickpea fry” it is. 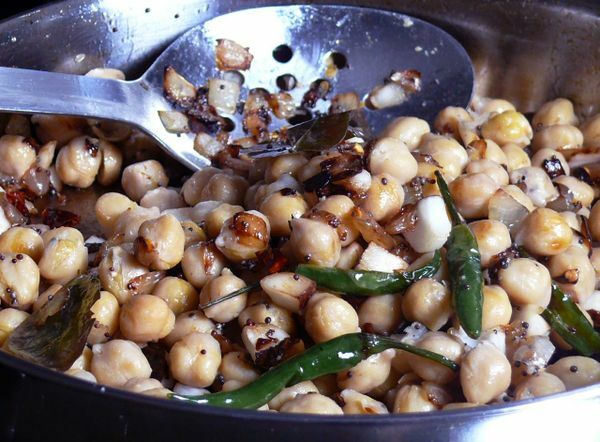 canned chickpeas work fine in this recipe. they only spend a few minutes in the skillet, but that’s all they need to mix with the sweet fried onions and aromatic curry leaves and mustard seeds. the curry leaves really are essential to this recipe (and they can be eaten in the final result), as they are in many south asian recipes. if you always want to have some on hand, wash and dry fresh leaves thoroughly, then freeze them in an air-tight plastic bag or small container. you can make this recipe without chillies or with just a sprinkle of dried chili flakes–that’s how my mom used to make them for me when i was a kid. other variations are encouraged too–i didn’t even know until recently that these chickpeas are served with fresh bird chilies fried in the mix the way you see them pictured here. frying the chilies whole means that you can take them or leave them. the heat doesn’t have to be a part of the experience but it’s there if you dare to take a bite. i highly recommend you try to make these with fresh coconut and if you dislike coconut, please wait! i know, i hear you. if you asked me about coconut a year or two ago, i would have told you i hate coconut (ignoring the fact that it’s at the heart of so many sambols and curries that i love). they really belong here and fresh coconut pieces just taste so different than coconut-flavoured whatever, i swear. but how to get at fresh coconut…? 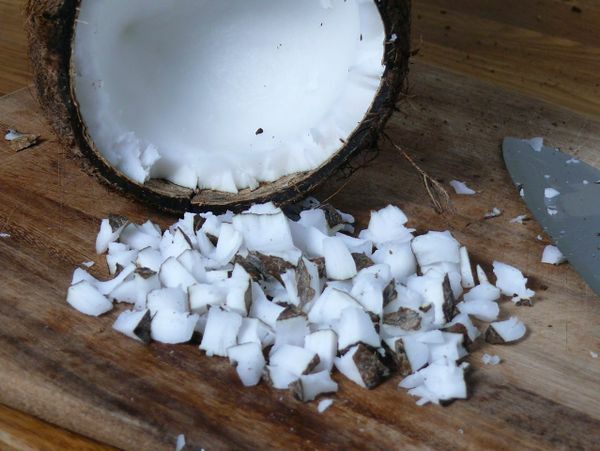 if you’ve never cracked into a fresh coconut, don’t be intimidated. you can do a couple of things to get into one. if you have a heavy, sturdy knife (a cleaver works best) use the back of it to whack against one of the vertical groves of the coconut. just angle the grove and therefore the arc of the swing away from you. if you were to slip, you don’t want the blade coming anywhere near you. use common sense and make sure your loved ones or anything else precious is out of the way too. but sometimes those shells are hard to crack and you have to do what monkeys do. go outside and drop it against a rock. sure, you’ll loose all that coconut water but it’ll probably be a one-shot task and you’ll be carrying on with the rest of the recipe in under a minute. simply chisel away at the flesh with the tip of the blade of a strong knife, to flake off chips for this recipe. once you have what you need, you can carve out larger chunks with the knife for a speedier process, and either dice the pieces or leave them large, stick them in an air tight bag or container and freeze them for use later. if you have a splatter guard you may want to use it. 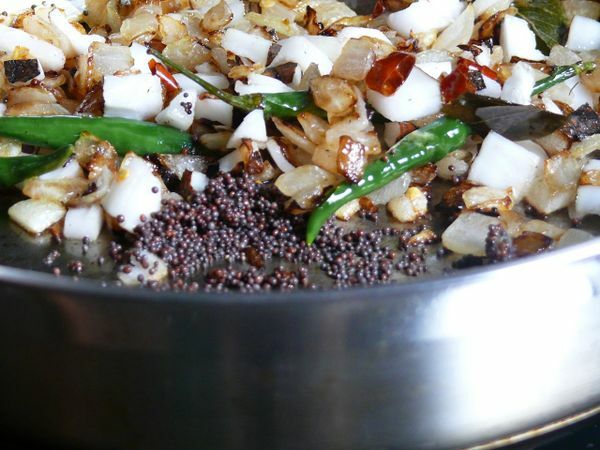 the curry leaves and mustard seeds may splatter when added to the pan. heat the oil in a large skilled over medium-high heat. when the oil is hot, add the curry leaves and let them fry for about 30 seconds. the add the onions to the skillet, sprinkle them with half the salt (1/4 tsp), stir well and let them fry, stirring frequently, until they start to brown at the edges (about 3 minutes). lower the heat slightly and add the green chilies and coconut pieces, if using, reserving about 1 tbs of the coconut pieces. stir and let fry for a couple of minutes, until the chilies soften. lower heat to medium and add the red chilies and fry for a minute of two. the dried chilies can burn quickly so if they turn brown quickly, lower the heat a little more. clear a hot spot in the skillet, pushing the ingredients aside. add the mustard seeds to the hot spot and fry them until they have stopped popping/sizzling. add the chickpea and mx well. add the remaining 1/4 tsp of salt to the skillet and stir frequently until the chickpeas have heated through. 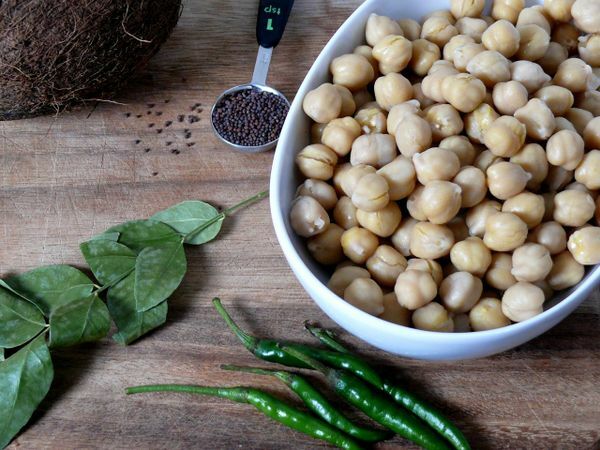 serve hot or at room temperature, garnishing with a sprinkling of coconut. makes 2 large servings, 4 appetizer servings or 6-8 h’ors d’ourves servings. Looks awesome. Are dried curry leaves okay? Do you just have it on its own? You’re definitely honourary Hakka — throw green chillies into everything, and I mean EVERYTHING. dried curry leaves should work fine. yes, you can have this all on it’s own. with a beer or some champagne would be even better! hah! well, it’s an honour indeed. i’m showing up at your next family picnic. i’ll fit right in. Looks very interesting! Never would have though of using cocunuts. Very nice site. thanks! and thanks for coming by my blog. i just started exploring yours–looks great so far and i love your header image! OMG you are a skilled cook – you battled a fresh coconut and won and put to use in such a wonderful dish too. May i use dried unsweetened coconut? I do not wish to do battle with a fresh coconut!